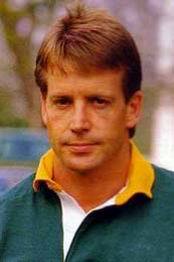 Say Johan Heunis and most people’s first recollections will be good manners, Springboks, Blue Bullls and Tukkies. True, Johan was and still is the impeccable gentleman; he represented South Africa in 14 tests (in the apartheid years), played 110 matches for the then Northern Transvaal (109 in the starting line-up) and also wore the coveted Tuks whites with distinction. A less known fact, however, is that Johan was born is George and finished his law studies (BProc) at the University of Port Elizabeth (Nelson Mandela Metropolitan University) before getting called up for his national service in Pretoria. Johan gained his EP colours in the same year (1979). “I have so many wonderful memories of my playing years in Pretoria, but will remember a match against WP in 1981 as if it took place yesterday. Seven weeks before that match I was struggling to get a break and only made in to the Northern Transvaal B bench. Johan says he likes to watch FNB Varsity Cup rugby when he has the time.